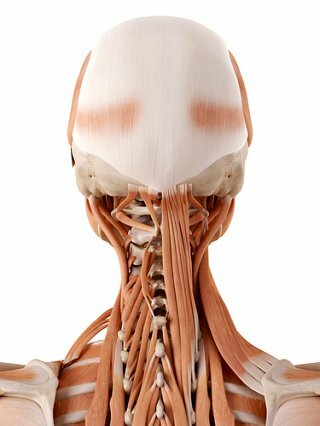 Your neck anatomy is complex - this is a hard fact to avoid! Treatment of neck pain is one of the most effective treatments I carry out in my physiotherapy clinic - and a better understanding of neck anatomy always helps the client and myself to work more effectively together. So, let’s explore your neck anatomy a little to help you understand the causes of your neck pain - and the effect of movement and mobilisation on this pain. I will attempt to make neck anatomy as simple as I can for you!! The neck begins at the base of the skull and connects to the thoracic spine (the upper back). It is made up of bones, discs, muscles, ligaments, nerves and tendons. Think of it like a jigsaw puzzle, all the pieces fit in together and are required to get the full picture as to how it works. Bones - The neck is made up of 7 bones called vertebrae, that provide strong protection to the spinal chord, yet allowing flexibility in movement. Each of these bones is stacked one on top of the other and in between them rest structures called discs. Discs - Discs lie in between each of the bones (vertebra) in your neck to cushion them and stop them from rubbing directly against each other. They are like jam doughnuts. They have a crispy shell and a pulpy/jammy inside. If they move out of place they can cause a lot of pain. If they press on a nerve when they move out of place, the pain can be very severe. Nerves. - The nerves of your neck are like little wires exiting between each vertebra. They are like the wiring system of your body and feed many muscles and organs. If they get pinched or diseased in any way the result can be serious. Imagine the wiring to a working part of your body becoming blocked - and what can happen as a result! Muscles. - You have many muscles in your neck have a role of moving and supporting your head and neck. Strain and tension within these muscles will lead to neck pain and movement dysfunction. Sometimes the muscles contract to protect the vertebra, leading to a “Crick in the neck”. Ligaments - The ligaments of your neck are another soft tissue that holds the bones of your neck together, without your ligaments the bones of your neck would go all floppy! They are the cementing material of your neck. So these are the main elements of the jigsaw - if one of the parts is out of shape or damaged, then it will effect the other elements surrounding it. Now, I know I am making anatomy of the neck very simplistic here, but it’s my opinion that if you understand it to this level then you will understand how each element is connected to the other. This is important in understanding effect of treatment (and incorrect treatment) on the different structures of your neck to relieve neck pain. As I say to my clients once we cover this much - let me know if you need more detail! Discover some of the possible causes of Neck Pain here.